First, you’ll need to find a yuca or cassava root. 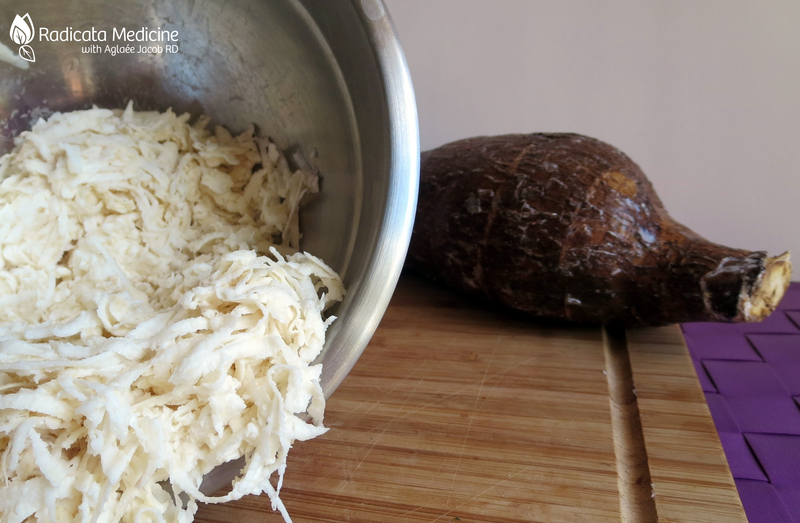 This is a tuber that is fairly commonly used in South America and will make the crust for your Paleo grain-free and gluten-free pizza. It is actually the only ingredient used to make the crust. Pretty cool, isn’t it? I personally can find yuca root at my local grocery store. If you can’t find it there, try different health food store or a latino shop. *** Make sure you read the note below if you have a thyroid problem. Then just be creative with the toppings. This is what a yuca root looks like. It’s also called cassava. 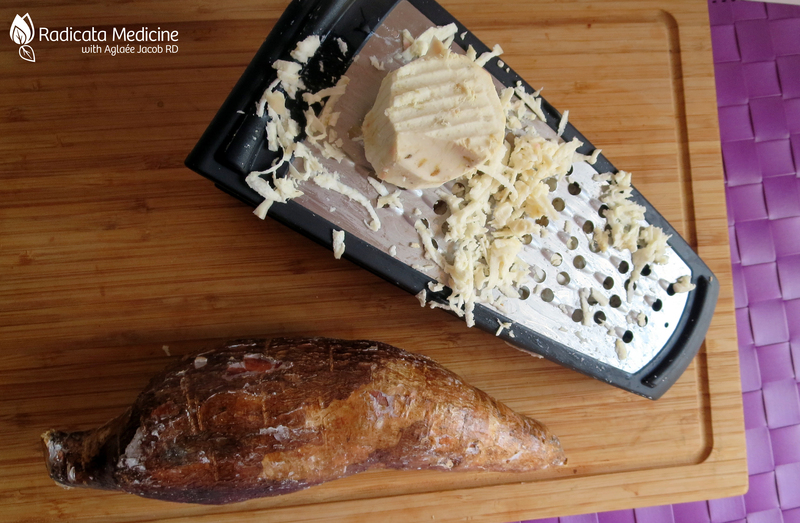 Just grate the yuca root. It looks like grated cheese. This is the only ingredient that will make your Paleo pizza crust. Trust me, it sounds crazy but it works! 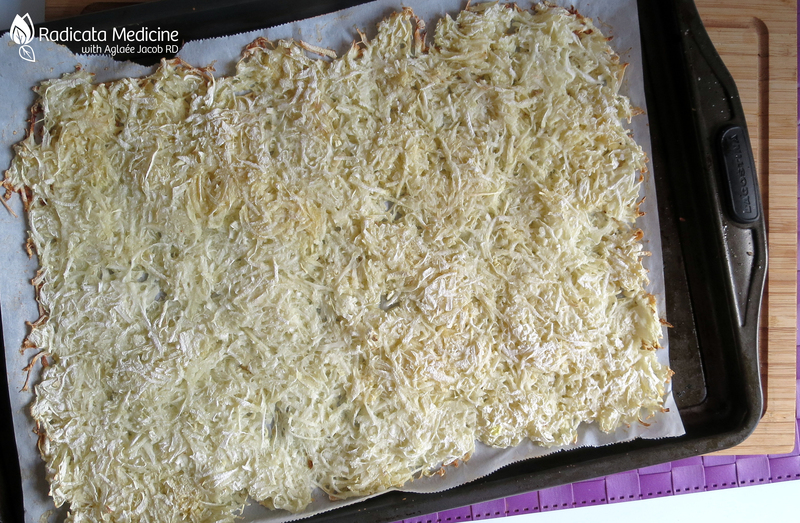 This is what the Paleo yuca pizza crust looks like once cooked. Peel your yucca root and grate it. Line a baking sheet with parchment paper greased with coconut oil or ghee (make sure you grease it because it will stick!). 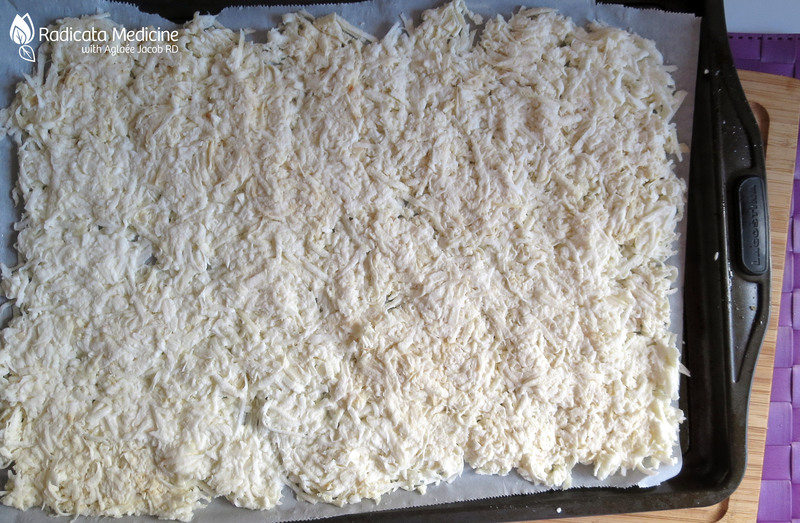 Press the grated yucca root on the parchment paper as thinly as you can to cover the whole surface. Bake your pizza crust in the oven for 20-25 minutes or until it appears dry, the edges are slightly golden and it holds nicely together. Meanwhile, prepare your pizza toppings and sauté the onions and mushrooms (optional step) in your chosen fat for 5 minutes or until cooked. 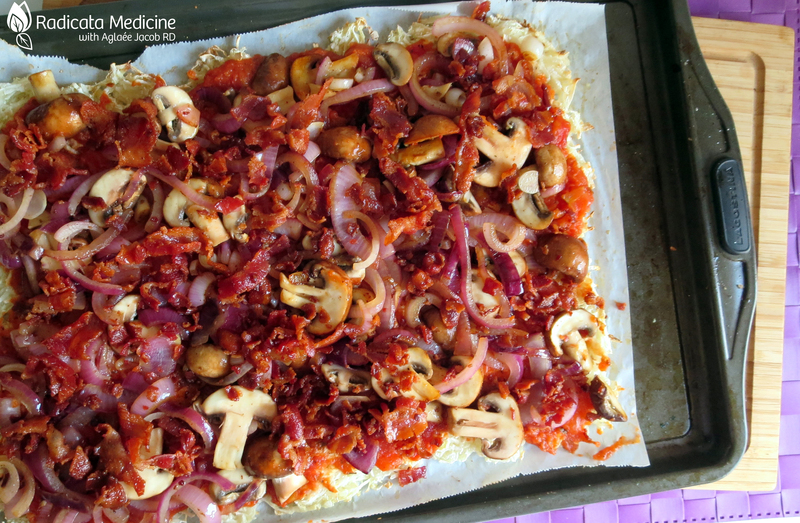 Once the pizza crust is cooked, cover with the tomato sauce and top with sliced onion, sliced mushrooms and bacon. Season to taste. 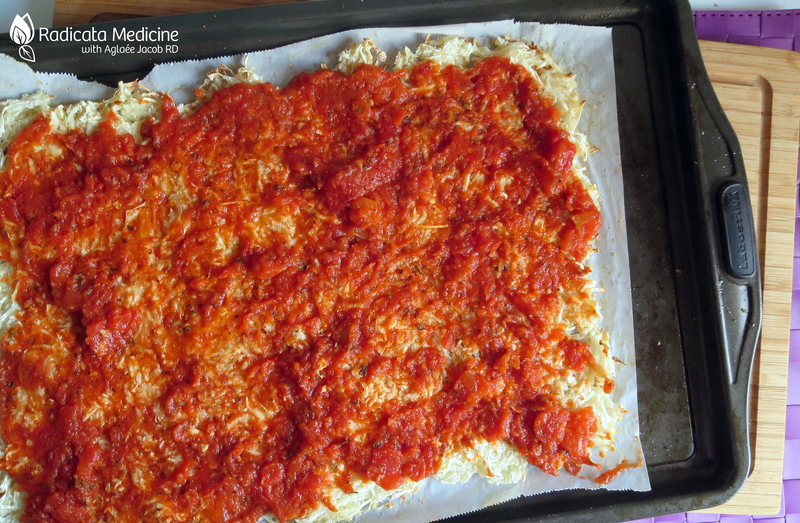 Cover the pizza with grated cheese. If desired, add cherry tomatoes at this point. Bake in the oven for an additional 15 minutes until everything is warm and the cheese melted. Put 2-3 minutes under broil if you want your cheese to be more golden. Decorate with fresh herbs and slices of avocado. Enjoy warm right away or eat the leftovers (if any!) cold the next day. If you’re sensitive to nightshade, use pesto instead of tomato sauce. Spread the crust with tomato sauce. Or use pesto sauce if you’re sensitive to nightshade. Make your own dairy-free and nut-free pesto if you’re on the autoimmune protocol. Still super yummy, I promise! Add all of your favorite toppings… et voilà! Bon appétit! 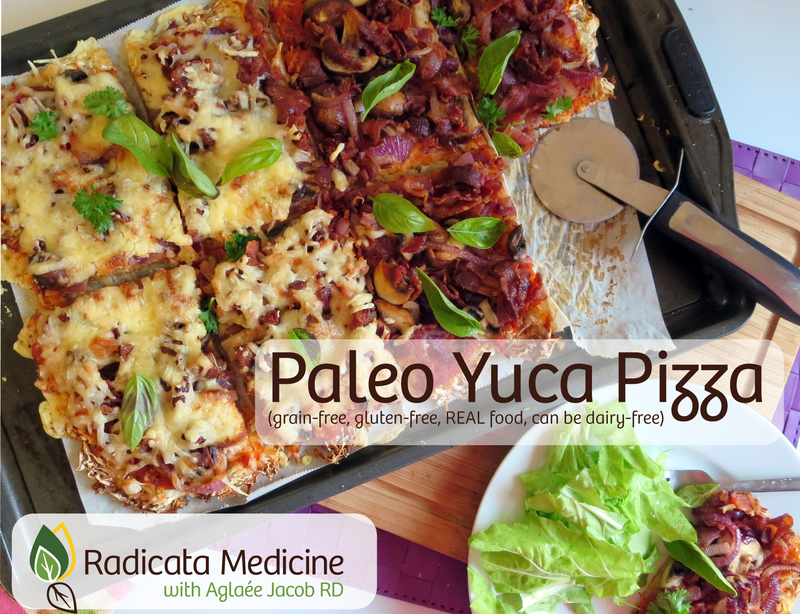 This entry was posted in recipes and tagged AIP, autoimmune, cassava pizza, gluten-free pizza, goitrogen, grain-free pizza, manioc pizza, paleo AIP, paleo autoimmune, paleo pizza, paleo pizza recipe, thyroid, yuca paleo recipes, yuca pizza, yucca paleo recipes, yucca pizza. Bookmark the permalink. ← Managing PCOS (polycystic ovarian syndrome) Naturally….. to feel better and maximize your fertility!